Chef Andrew Farrell and Crispy Greens Mac & Cheese. 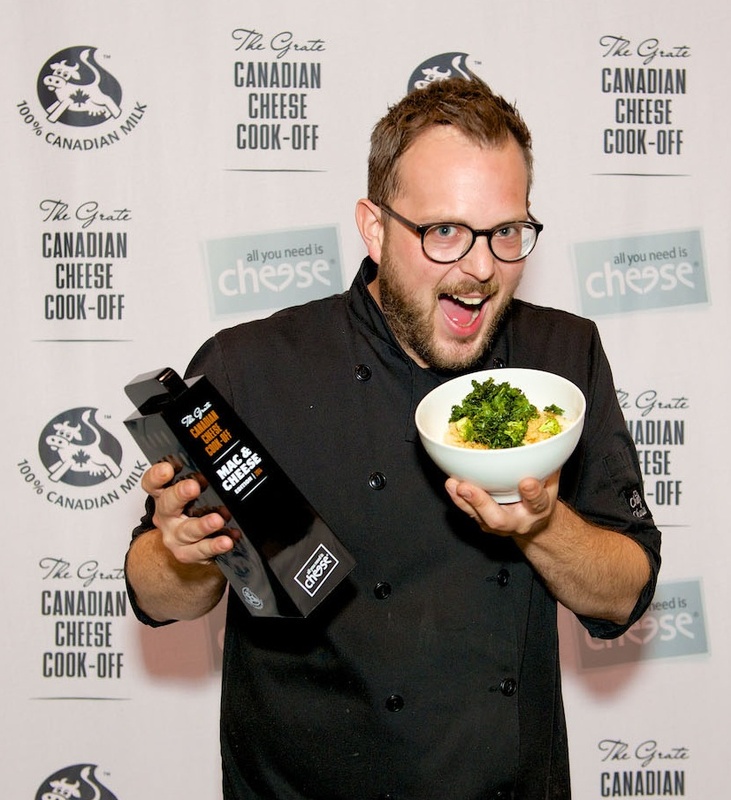 Chef Andrew Farrell of Halifax took home top honours at the 2014 Grate Canadian Cheese Cook-Off for his Crispy Greens Mac & Cheese. The Mac & Cheese showdown took place at Dairy Farmers of Canada’s Canadian Cheese Counter at the Canadian National Exhibition in Toronto in front of a crowd of cheese fans yesterday. Four accomplished chefs and foodies from across Canada took to the stage in an attempt to create the ultimate comfort food using Canadian cheese, pasta and a little imagination. In the end, it was Chef Andrew Farrell from 2 Doors Down in Halifax who emerged victorious. 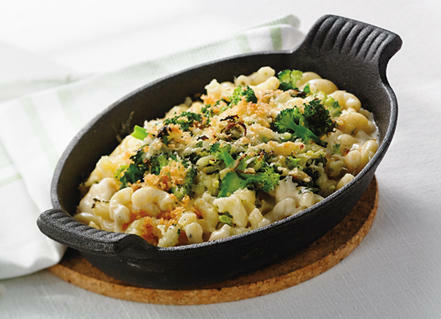 Chef Farrell’s Crispy Greens Mac & Cheese was voted best overall by a panel of four cheese-loving judges. His dish packs a whole lot of Nova Scotia into one dish, with four cheeses from That Dutchman’s Farm—three Gouda and one Blue—produced in Upper Economy, Nova Scotia. Cheesy noodles are then topped with a kale-broccoli-Brussels sprouts crust and Sriracha hot sauce adds a spicy kick. This year’s four fierce competitors included Bal Arneson, Food Network TV host and award-winning author from Vancouver, British Columbia; chef David Bohati, executive chef at MARKET Restaurant in Calgary, Alberta; Kevin Durkee, owner of CHEESEWERKS in Toronto, Ontario; and chef Andrew Farrell, head chef at 2 Doors Down in Halifax, Nova Scotia. The Cook-Off was organized by Dairy Farmers of Canada to take Canada’s beloved Mac & Cheese to a whole new level and showcase the outstanding quality, variety, taste, and versatility of Canadian cheese made from 100% Canadian milk. Crispy Greens Mac & Cheese. Cheese lovers across Canada can access the four Mac & Cheese recipes and find tips for making the perfect Mac & Cheese by visiting www.allyouneedischeese.ca/cookoff.